As a coffee lover, do you imagine your mornings filled with the sound of organic bean-crushing at its finest? Does the smell of freshly ground then freshly brewed coffee set you up for a terrific day no matter what kind of commuter hell you have to endure? You need a manual coffee grinder. Specifically, you need a coffee grinder that looks beautiful on your counter. 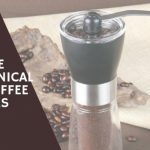 We review here 3 of the best wooden coffee grinders to find the perfect one for your coffee crushing needs. 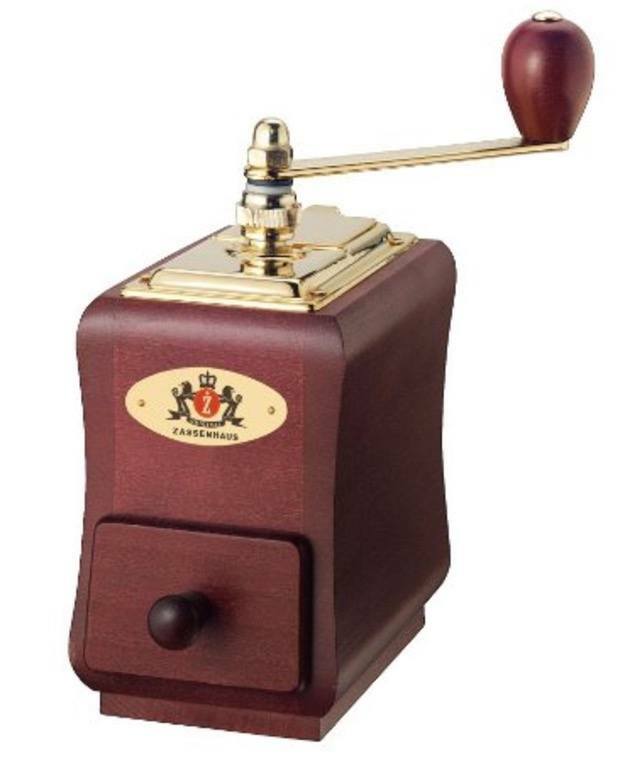 This conical burr manual grinder has a beautiful mahogany housing for the grinder mechanism. The finishing details are stunning as well. This is a grinder that will really add to the appeal of your kitchen. Just looking at it, you can see that it will look amazing next to your other kitchen accessories. That’s only touching on how the grinder looks. Let’s talk about its features. The Zassenhaus Santiago is designed by a company that prides itself on creating quality equipment that will last for a very long time. The mahogany stained Beech gives it a rich look that still remains homey. The coffee catching drawer is solidly designed and created. There’s no play in the drawer at all. It also doesn’t fall open while grinding. 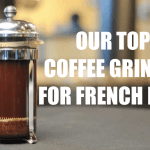 The grinder will make very fine to coarse grind for your morning coffee. There’s an adjustment knob under the unit that can be used to change the settings depending on the grind that you desire. When it comes to manual grinders, you’re exchanging speed for better coffee. That means you’re not going to get the speed and ease-of-use you’d get with an electric unit. With that being said, the mechanism is smooth and the handle is easy to turn. 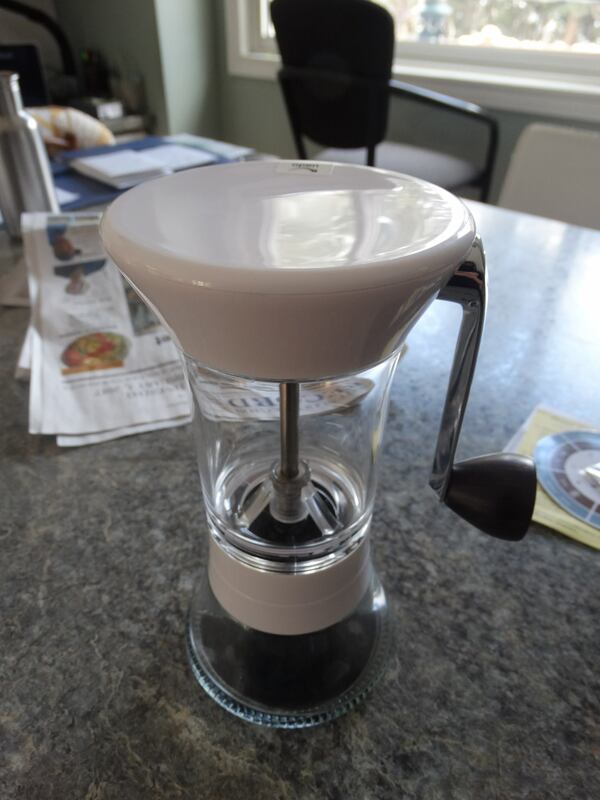 The Clever Chef manual coffee grinder company touts its product as durable and easy to use. They back up their claims with a one-year warranty on the grinder, which will cover a full refund or a replacement unit. You can imagine this wooden manual grinder sitting on the counter of your great-grandmother’s kitchen back in the days prior to electricity. It’s a durable cast iron and wood combination of construction that can stand up to daily grinding. The mechanism is easy to adjust to get very fine to coarse grinds. When first purchasing, it’s recommended that you check the adjustment to ensure that it’s in the correct position for your needs. Remove the handle and spacer to adjust the grind to your specifications. While some people said that the unit is wobbly when grinding, it does require a two-handed operation. One hand should be holding the unit while the other turns the handle. The mechanism is smooth and makes great grinds in no time. While we’re reviewing the walnut unit, this grinder comes in a variety of colors and woods including Beech and ivory with different bean hopper styles. 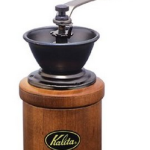 It’s a manual burr style grinder with adjustable grind settings. The company offers a lifetime warranty on the mechanism and five years on the exterior parts. This is the same company that creates stunning automobiles. 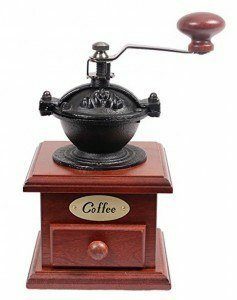 They first started with quality hand tools, but in 1840, they created the coffee grinder. They’ve tweaked and perfected the design over the years. It’s hard to come close to the quality and rich appearance of the Peugeot. The mechanism is what sets each coffee grinder apart from the other. 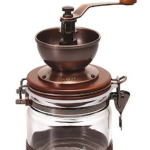 The manual burr style grinder ensures that each bean is cracked and ground efficiently. There’s an adjustment to change the settings to your desired coffee style. The hopper of this grinder is a bit larger than others of its size. You’ll easily be able to add enough beans for a pot of coffee. You’ll likely have to empty the drawer underneath if you plan to make a large amount of grind. That completes our list of the best wooden coffee grinders we’ve explored. It was tough to pick just three since this style is reminiscent of a time and place when people ground their own coffee by hand and sat by the fire at the end of the day. It’s what we consider one of the most important parts of a manual grinder, and these wooden ones bring about a nostalgia for a time we never lived. Man, I have been thrilled with the consistency yielded from the Baratza Encore. But after this article, I really think I have to get my hands on one of these awesome manual, wood grinders. These are just too cool! I found a little wooden mill that looks like a pepper mill, but if you look at the bottom it looks different. It looks kind of a circle that’s been cut in 6 parts and 3 parts have been folded forward to form outward spikes. On the handle I saw the brand Zassenhaus and I am quite interested if anybody knows what kind of a grinder this is as I cannot see how I can put anything into the wooden container. If I pull the handle up it seems to have a spring inside the wooden part.